Loreto has a bookstore called Baja books that sells used and new books, and also offers pottery lessons in the sideyard which is a fun time especially for kids. Those interested in adventure reading and Loreto should definitely get a hold of some John Steinbeck books (describing Loreto in the 1950s as being “asleep in the sunshine”). 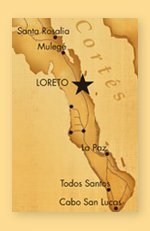 For travel guides, the one and only is Alan Axelrod’s Best Guide Loreto.